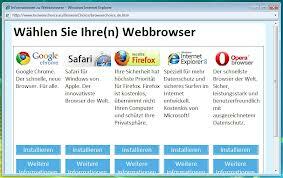 European regulators say Windows needs to offer more than just Internet Explorer. Three hazy, distant years ago, the European Union Commission signed a deal with Microsoft in which the software giant agreed to start packaging various non-Internet Explorer web browsers in with Windows. Doing this would save the company from breaching the EU's antitrust laws at the same time as saving Europeans from having to venture into Internet Explorer against their will. If Microsoft failed to abide by this agreement, it could be subject to fines of up to 10% of its annual global revenue. As of this week, Microsoft has officially failed to obey the agreement. In an formal notice of warning, the EU Commission notes that the "browser choice" screen (above) that Microsoft designed to comply with the terms of the original agreement was nonfunctional for as many as 28 million customers between February 2009 and July 2012. Microsoft blames the outage on a technical error, adding in a statement that it "takes the matter very seriously" and takes "responsibility for what happened." Following this notice, Microsoft now has four weeks to respond to the charge as it sees fit. Once this time period is up, the Commission will decide how serious the breach was and what kind of fine, if any, it will impose. The upper limit is 10% of Microsoft's annual revenue, which is kind of an eyewatering sum of money. Given that the European Union has to date fined Microsoft €1.64 billion (US$2.1 billion) for various offenses, a fine for this particular breach wouldn't mark a huge deviation from the norm. In a separate announcement, the EU Commission also announced that it would not be pursuing an antitrust case against Microsoft for only having Internet Explorer pre-packaged on its Windows 8 and Windows RT tablet devices. While I am not a lawyer and will (sadly, probably, crushingly) never be one, my uneducated guess for the reasoning behind this would be that Microsoft's share of the tablet market is small enough that the Commission need not involve itself. Expect to hear more as the case continues, especially regarding how quickly Microsoft will fix its "browser choice" screen. European Windows users shouldn't have to have that one trip to Internet Explorer to download Firefox or Chrome. Isn't the debt crisis enough? Save us this one last indignity, Microsoft.